Land snails are an integral part of life. They consume organic material on the forest floor and recycle plant and animal waste. Amphibians, reptiles, birds, and small mammals also feed on land snails; so they form an important link in the food chain. Land snails are also important in that they provide windows into the overall health of the ecosystem. The U.S. Fish and Wildlife Service has stated, "Land snails are a particularly practical group to assess the health of an ecosystem." Something to think about: If you don't have slugs & snails in our garden and this hasn't been a result of your own efforts or local predators such as birds, it may be an indicator of high levels of toxins in your garden. 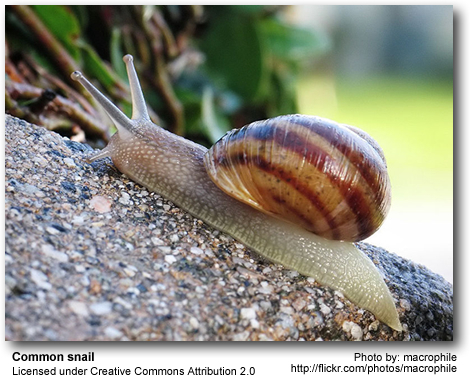 Snails eat a variety of different foods, including leafy vegetation, fruits, and carrion. They can cause damage to agricultural crops and garden plants, and are therefore often regarded as pests. It is important to stay away from snail and slug baits containing metaldehyde or methiocarb. These chemicals have killed countless thousands of domestic pets and birds over the years; not to mention beneficial insects and earthworms. Metaldehyde is toxic to all creatures that consume it, be it through direct ingestion or secondary poisoning from consuming poisoned prey. There are various way of controlling them without the use of toxic chemicals. Consider planting "repellent" species in amongst your other plants. These include Lavender, Thyme, Sage, Geraniums and Mint. Snails and slugs prefer plants with soft leaves or decaying plant material. It is recommended to grow plants with leathery leaves like Bergenia. Avoid overwatering your garden and preferably use direct watering methods. Snails and slugs are attracted to moist areas so if your garden bed is relatively dry on the surface between the plants, this will help discourage activity. As snails and slugs are most active at night. Try to water in the mornings so the top layer of soil has a chance to dry out. A way to deter snails and slugs (this will not stop them!) is making the surface hard to crawl on. Things you can use are gravel or grit, crushed eggshells, pine needles, straw, sawdust, shredded bark, animal or human hair, a mulch of cocoa shells that can be purchased at garden centers, thorny branches or leaves. One method of stopping snails and slugs is the use of a barrier. The use of mesh wire netting is the easiest way. It doesn't need to be high and the top can be bend outwards in a 45 degree angle to stop snails climbing over the top. Of course, small slugs or young snails can crawl through the holes of the mesh wire-netting. A solution can be to use the kind of netting used to keep insects out, or a strip of metal again with the top bend outwards. This will get very hot in the summer months making it even harder for snails and slugs to cross. Ground coffee deters, but only kills young snails and slugs, and you need ground up coffee beans for it to really work, not used coffee grounds. Used coffee grounds makes a pretty good mulch for your garden and if it deters a few slugs and snails. An easy way to reduce the numbers of slugs and snails (although you have to be persistent) is by picking them by hand. The best times are early morning, late in the evening or on rainy days. Put them in a bucket and release them somewhere in a park or wood, but don't dump them in a bucket with water to drown (this can take a long time) or even worse put salt on them! These are inhumane tactics, and besides we should never forget that snails hold an important place in our environment, as outlined above. Snails and slugs have a large number of different enemies which you can encourage by making your garden more attractive for them. Hedgehogs, for example, are :very useful because they eat a large number of snails and slugs. Frogs and toads need water of course, but having a pond is a good way to attract wildlife. Songthrushes, mistle thrushes and blackbirds: Thrushes are especially keen on snails, of which they break the shell against a rock. Ground Beetles are very good hunters of slugs. Other minor predators: Rats, Jackdaws, Magpies, Rooks, Glow Worms, other slugs and moles. Ducks and chickens have both snails and slugs in their diet, but not everybody has a garden big enough for them. They also do more damage then good when not controlled well. A very common way to get rid of snails and especially slugs is the beer trap. I personally dislike the idea as I prefer more humane methods, but a lot of people use them. When you do you have to keep in mind a few things: To be really succesful you have to have one beer trap per one square meter. Make sure beneficial insects like beetles can get out again if they happen to fall in. In rainy weather the beer will get watered down and loose its effectiveness. A much better way is the use of sheets of wood, old carpet, boards or basically anything slugs and snails will crawl under. Remove them in the morning and you will get better results than beer traps.